I'm on a mission to make developers' lives as simple as possible, and I just released Browserling's Safari extension. Safari extension lets you quickly access all Browserling's browsers with one click right from your browser. No need to go to www.browserling.com first. Just install the extension and you can start testing. Browserling now has extensions for four major browsers - Firefox, Opera, Chrome and Safari. I've also submitted Safari extension to Safari Extension Gallery and it will soon be available there. I'll make an announcement when it is. Work continues on finishing the extension for Internet Explorer. 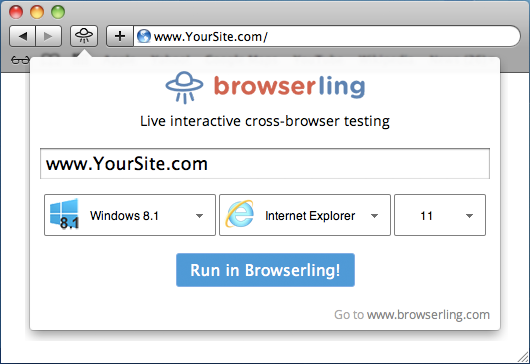 Once done Browserling will have extensions for all five major browsers. This blog post is a repost of Announcing Browserling's Safari Extension from Browserling's cross-browser testing blog.